Comfortable 2 Bedroom cottage near the shore in Shediac Bridge, New Brunswick. Sleeps six, fully equipped. Stone fireplace, propane BBQ, children's playcentre, outdoor fire pit, close to Parlee Beach and downtown Shediac. Situated on a large, quiet lot, nestled among the trees, within short walking distance to private beach. One hour drive to Prince Edward Island and Nova Scotia, and a 15 minute drive to Moncton. July/August: $800 per week, Saturday to Saturday for a family of four; $50 extra per person per week. Off Season: $650 per week, Saturday to Saturday for a family of four; $50 extra per person per week. 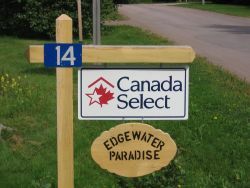 "best vacation yet in our five years coming to Shediac"
"my wife & I celebrated our 25th wedding anniversary star-gazing at night by the camp fire"
"hosts were exceptional and treated us like parents"